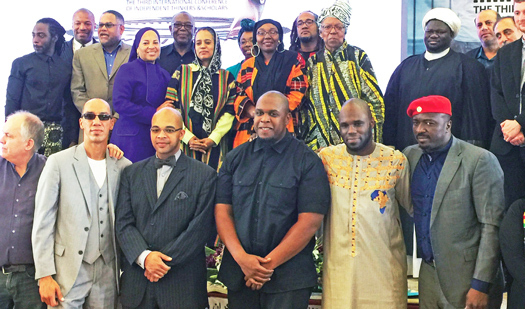 A delegation at the New Horizon Conference recently in Tehran, Iran which included members of the Nation of Islam including, in the front row second from left, Mikail Yusuf Muhammad, next to him Imam Sultan Rahman Muhammad and in the back row second from left, Earl Muhammad, fourth from left Nisa Islam Muhammad, and next to her, A. Akbar Muhammad. TEHRAN, Iran - The horrific issues of racism and police brutality in America were the focus of the third annual New Horizon Conference (NHC) called “On the Brink” October 27-29, that featured presentations from an international interfaith delegation that included five members of the Nation of Islam. “Today one witnesses a blind brutality that can be only seconded by an extreme example, that of Daesh or ISIS,” said Nader Talebzadeh, New Horizon Conference Chair. Police confrontation with ordinary citizens of color has taken a wicked turn in the past decade, he explained. “Experts however believe it has always been this way, the only difference being the social media’s massive reflection,” added Mr. Talebzadeh. “The NHC gathered Black American thinkers, writers, and activists on the subject bringing to close proximity the free thinkers of the racial violence in the U.S. with the masses and academia in Iran, a country that has withstood U.S hegemony for the past 36 years and has been punished for it accordingly,” he continued, laying the groundwork for the purpose of the gathering. That U.S. hegemony came as a result of the Iranian revolution in 1979 which overthrew Mohammad Reza Shah Pahlavi known as the Shah of Iran at the hands of Ayatollah Ruhollah Khomeini, a former professor of philosophy in Qom who was exiled in 1964 after speaking out harshly against the shah’s oppressive reforms. 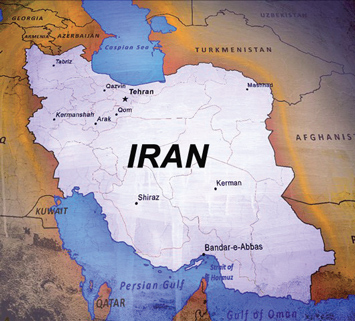 Iran is in the midst of finalizing negotiations with the U.S. over their nuclear capabilities. The country has been under sanctions for nearly four decades since the revolution with $100 billion frozen in U.S. banks without interest accumulating. Nation of Islam resident Imam Sultan Rahman Muhammad, great-grand son of the Honorable Elijah Muhammad, gave a passionate and stirring presentation on Justice Or Else: The Universal Imperative. “Master Fard Muhammad initiated for our people a hijra (migration) of the heart, a hijra of the mind so we could establish for ourselves a nation of our own within a nation without a gun,” he said. “We were the only nation that lifted a flag during the Jim Crow era that meant we were free, justified and made equal of all mankind. Today represents an opportunity and time where we as an ummah (community of Muslims) can come together for freedom, justice and equality. We have been on a 400 year journey to return to ourselves because we have been made other than ourselves in the midst of a satanic nation,” said Imam Sultan Rahman Muhammad during his presentation. This was Abdul Akbar Muhammad, International Representative of the Nation of Islam’s fourth trip to Iran. He came in 1996 with the Honorable Minister Louis Farrakhan during the World Friendship Tour. During that visit on February 11, observed as the Day of the Revolution celebration, Min. Farrakhan spoke to a massive crowd of six million people gathered at Revolutionary Square and another four million watching on TV. “If we are going to win this battle for our community and all young men threatened by this mentality that exists in these police departments, we must find a way to work out our differences, form alliances and not become divided,” he said during that historical address. “Be careful not to allow the enemies of our struggle for justice to pull you aside, give you money and sponsor your programs thinking your plans will fly in the face of others who are struggling. … Let’s not fall victim to our enemy’s strategy of divide and conquer. Let’s commit to the principle position of united we will stand and God willing, we will win,” the Muslim leader said. Iranians were very happy to see so many from the Nation of Islam attending this year’s conference. In addition to Imam Sultan Rahman Muhammad and A. Akbar Muhammad, the N.O.I. delegation included: Earl Muhammad from Las Vegas who spoke on the economic conditions of Blacks, Mikal Yusuf Muhammad of St. Vincent and the Grenadines spoke on the pervasive effects of American culture on Blacks and this writer presented as well. Marzieh Hashemi is a Black woman from New Orleans who was so moved by the revolution that she came to Iran, married and started a family. An anchor for Press TV, Iran’s English speaking news station and a documentarian, she was instrumental in organizing the New Horizon Conference. “I believe in the goals of New Horizon because of the dedication of Mr. Talebzadeh. So many times we have organizations that say they are for this or that but unfortunately the reality is sometimes people at the top, they don’t really care. Taleb sincerely cares and believes in what he’s doing. It’s because of his sincerity, also the goals of the overall conference and organization that brought me aboard,” she told The Final Call. The topics of racism and police brutality in America interested the entire country. The conference was surrounded by media representatives who conducted numerous interviews with the delegation throughout the three days. The remaining days of the delegation’s visit were spent doing more media interviews, speaking on college campuses and to other organizations. The gathering was highlighted by the poetry of Amir Suleiman and Ali Douglas Newman and the creative arts presented by husband and wife team Candice Wicks and Hodari Davis. The delegation also included Manuel Galiana Ros from Spain, Muhammad Jollah from Sierre Leone, Kemi Seba and Pierre Jules from Paris. Zeinab Mehanna from Lebanon spoke on the history of Blacks in Islam, Dr. Vernellia Randal on Understanding the School to Prison Pipeline and activists from the American Human Rights Institute Cecile Johnson and Elaina Cooper and independent Journalist Caleb Maupin spoke on the commonalities between Blacks and angry young Whites also dissatisfied with America. Dr. Musa Dan Fadio presented on the topic “African American Declaration of Self-Determination” and Dr. Declan Hayes from Ireland spoke on Israel.